In "A political non-rant," earlier this week I said there was only one possible exception to my desire not to have any living president serve again. Who is that exception? Jimmy Carter. According to the off-the-shelf narrative, we're supposed to think that Carter was a terrible president but a great human being. I readily admit that when Carter left office the country was at low-ebb. It's easy to overlook that Carter inherited many problems. He came into office not long after our Vietnam debacle came to its humiliating end with the dramatic news footage of the evacuation of Saigon in 1975. He also served in the wake of Watergate, Nixon's resignation, and Ford's pardon of Nixon. who was likely guilty of committing felonies. In the chaos that succeeded the dramatic year of 1968 during which Dr. Martin Luther King and Senator Robert F. Kennedy were assassinated, the nation found itself adrift in rapidly changing times without the kind of leadership it needed. When he was elected in 1976, Jimmy Carter, who came out of nowhere to win the Democratic nomination and then the presidency, was seen as a breath of fresh air. In what became known as his "Great Malaise" speech - it is called this despite the fact that he did not use the word "malaise" in the speech - Carter set out to diagnose the roots of the nation's crisis. The speech, given to the nation on 15 July 1979. It is probably better called Carter's "Crisis of Confidence" speech. I was reminded of this speech by an article in Sojourners by David Schwartz: "Revisiting Jimmy Carter’s Truth-Telling Sermon to Americans." After Fourth of July, Carter went to Camp David for ten days to consider the problems facing the country and his own political problems. During his Camp David retreat, Carter read from the Bible, he read Christopher Lasch’s book The Culture of Narcissism and E.F. Schumacher’s Small Is Beautiful, which Schwartz describes as "a meditation on the value of local community and the problems of excessive consumption." Schumacher's book, at least in my view, is still a must read. In addition to the reading, he consulted with religious leaders, business and union leaders, other politicians and assorted intellectuals. "By the end of his retreat," Schwartz observes, "Carter had concluded that the country faced more than a series of isolated problems. Collectively they comprised a fundamental cultural crisis." In his speech to the nation Carter asserted, "In a nation that was proud of hard work, strong families, close-knit communities and our faith in God, too many of us now worship self-indulgence and consumption." The speech went over very well and saw Carter's support jump significantly nationwide. Shortly after the speech, Carter, who was making changes in his personal life-style even while president, seeking to build on the momentum of his speech, massively reorganized his Cabinet. Rather than making changes incrementally, he sought rapid and wholesale change. This move, politically-speaking, was a miscalculation and ultimately spelled his electoral doom. With Some years after leaving office, Carter, who was famous for being an practicing Baptist and committed Evangelical, left the Southern Baptist Convention (SBC) as it was being overtaken by the Fundamentalists. These same Fundamentalists who succeeded in taking over the SBC are the same group who quickly co-opted the term "Evangelical." Evangelicalism was initially conceived of after World War II as a solid middle way between fundamentalism and extreme theological liberalism. It is this same group who, due to their "complementarian" sexism, are currently in hot water as the SBC experiences its #MeToo moment. The façade of the brutishness known as fundamentalism has been stripped away. While I readily acknowledge the overly simplistic nature of this assertion, the country basically ignored the hard truths Carter told us in his Crisis of Confidence speech by electing Ronald Reagan in 1980. The deregulation and militarization mania that characterized the Reagan years has led to a lot of bad consequences since. Without exception, since that time we have been governed by Republican and Democratic neo-conservatives. It seems to me that we were at something of a crossroads at the end of the 1970s and chose to go down one road, the one we've been moving down ever since, which I can't help but think has reached its terminus with our present situation. Let's not forget that since the 1980s we have built in an economy that lives or dies by consumer spending and consumer debt. This was a major cause of the 2008 collapse. Rather than take a lesson, we've set about rebuilding the same economy. The only constant in such an economy is that more and more wealth is distributed upward and the divide between haves and have-nots grows wider. And so, we lurch from one bubble to the next. It is significant to note that Reagan was elected with overwhelming "Evangelical" support, aided in a big way by the nascent Morality Majority, headed by a Fundamentalist who branded himself an Evangelical- Reverend Jerry Falwell. This brings me to another aspect of this post, the theological one. In July of 2017 Fr Anthony Spadoro. S.J., editor of the quasi-official Jesuit monthly La Civilitá Cattolica (the contents of each issue are reviewed and approved by the Holy See's Secretariat of State prior to publication), along with Presbyterian minister Marcelo Figueroa, published an article on religion and politics in the United States: "Evangelical Fundamentalism and Catholic Integralism: A Surprising Ecumenism." This article caused a bit of a stir and outraged those Catholics who are part of the alliance Spadoro and Figueroa identify and criticize. While there was a lot of sputtering, among the several rebuttals I read there was really not a persuasive response. Just the other day, Spadoro and Figueroa marked the anniversary of their first article with a second one: "The Prosperity Gospel: Dangerous and Different." The "prosperity gospel" is a well-known theological current emerging from the neo-Pentecostal evangelical movements. At its heart is the belief that God wants his followers to have a prosperous life, that is, to be rich, healthy and happy. This type of Christianity places the well-being of the believer at the center of prayer, and turns God the Creator into someone who makes the thoughts and desires of believers come true. "The risk of this form of religious anthropocentrism, which puts humans and their well-being at the center, is that it transforms God into a power at our service, the Church into a supermarket of faith, and religion into a utilitarian phenomenon that is eminently sensationalist and pragmatic"
This, of course, is not Christianity but its inverse. While being careful to distinguish the two as well as making an effort to see some positive in certain conceptions of the American Dream, the authors go on to link the Prosperity Gospel with the so-called "American Dream," seeing between them a symbiotic relationship. They also note how rapidly the Prosperity Gospel has gone global. This theology [the theology of the American Dream] clearly serves the economic-political-philosophical concepts of a neo-liberal model. One of the conclusions made by exponents of this theological tradition is geopolitical and economic in nature, and tied to the place of origin of the prosperity gospel. It leads to the conclusion that the United States has grown as a nation under the blessing of the providential God of the Evangelical movement. Meanwhile, those who dwell south of the Rio Grande are sinking in poverty because the Catholic Church has a different, opposed vision exalting poverty. From political connotations, it is even possible to verify the link between these positions and the integralist and fundamentalist temptations. To the critics who insist Spadoro and Figueroa lack an understanding of U.S. politics both domestic and global, these two articles show they have a deeper understanding than do most citizens and leaders of the U.S. Being a quasi-official publication of the Holy See, in addition to showing how the theology and politics of this alliance are at odds with the Gospel, they also highlight with specificity what Pope Francis, in his papal magisterium, addresses more generally. 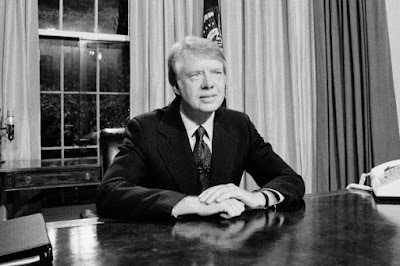 If you want to hear about the mores that publicly matter, listen to Carter's "Crisis of Confidence Speech" for yourself (a link to a video of the speech is provided above or you can click here). Hey, Carter only served one term. So, he's not constitutionally ineligible to serve again. To date, the only president in our nation's history to serve two non-consecutive terms is Grover Cleveland, who served from 1885-1889 and again from 1893-1897. At 92, I don't think Jimmy Carter is inclined to seek a second term but he is something that most people in the U.S., Christian or not, do not know exists, or existed, in politics: a committed Christian who is not right-wing. Another exemplar of this was the late Republican Senator from Oregon, Mark O. Hatfield, who died in 2011.